Aren't we doing New Year's all wrong? 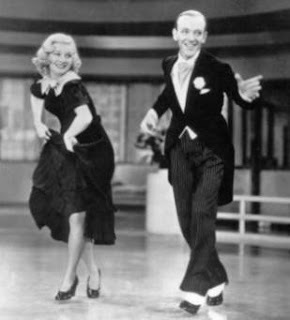 Despite Fred and Ginger gracing this post, I'm not lamenting the decline of white tie and tails as evening wear and the very elegant and sophisticated nightclub scene that exists now only in Fred and Ginger's old movies. I've probably groused about that before. Today, however, it occurs to me that we're doing this New Year's thing all wrong: For a country allegedly founded upon (and infatuated with) the Protestant work ethic (even American Catholics, Muslims, Jews and atheists are expected to have a good PWE) why is it that we have tomorrow off? I mean... shouldn't we start the new year hitting the ground running at full speed ahead? Isn't taking New Year's Day off sort of setting a bad example for the rest of the year? I'll be thinking about this tomorrow. But I still won't come into the office. 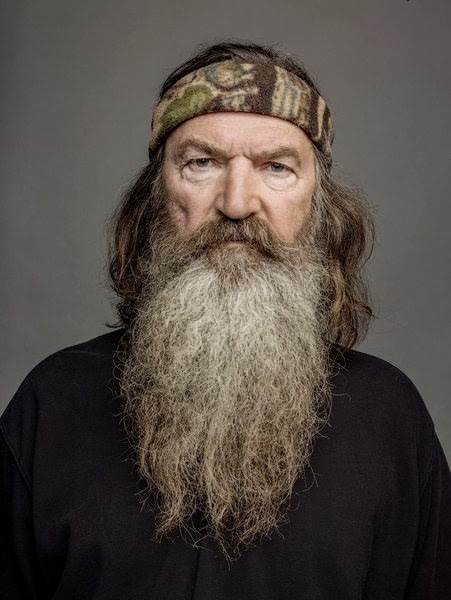 Duck Dynasty: Why is anyone surprised that a weird character on a "reality" TV show has politically incorrect opinions? I've never watched Duck Dynasty and nothing I've seen or heard or read in the last day or two suggests that I would ever want to. But let me ask this: Why is anyone surprised? Why is anyone outraged? A&E (which used to provide actually watchable TV programming, several years ago) found a weird-looking family that makes duck calls in the swampy backwoods of Louisiana and created a "reality" TV show about their weird lives, hunting, fishing and making duck calls. Phil Robertson, the gentleman pictured here, is the 67-year old "patriarch" of the clan. Have I gotten anything wrong so far? Now take just one more glance at Mr. Robertson. Why would anyone think that Mr. Robertson's views would be compatible with those of the persons employed by the New York ad agencies who buy time on reality TV shows? Each can hardly believe the other is a citizen of the same country. Now another question: What would GQ, a magazine that purports to cater to men interested in style and fashion, want from an interview with the Duck Dynasty clan? Isn't that one an easy one to answer? Drew Magery's article for the January issue of GQ, titled (at least online), "What the Duck?," may not have been intended as a hatchet job, but it was at least intended to give the smart, well-dressed metrosexual readers of GQ something to laugh at and people to make fun of. Men who buy a magazine that features articles like "Women are Judging Your Nails" are not interested in duck hunting or backwoods philosophy per se. Mr. Magery addressed the controversy in a Wednesday post on Deadspin. He wrote, in part, "[W]henever I go deep into the heart of 'MERICA * * * I'm always careful not to be the sneering LIBRUL who ventures into red-state territory just to rip on all the people there. That would be unfair, predictable, and dickish." No, sir. Mr. Magery just writes what he sees -- and his audience does the ripping for him. Mind you, I'm not defending Mr. Robertson. Granted, he has a right to his views, even though I may disagree with some or all of them. However, I completely understand and agree that the folks who run A&E have a right to "suspend" Mr. Robertson for offending the New Yorkers who buy ad time -- it's their network and they are privileged to do with it as they wish. Even if they daily make TV a far worse, far more vast wasteland than Newton Minow's worst nightmare prediction. I'm not even criticizing GQ. They came up with a scheme to get some free publicity and sell some magazines. That's the American way, right? And Mr. Magery got paid to write a story. Good for him. The only one I think is open to criticism here is the the PR genius who told the Robertson family that doing this GQ story would be a good idea. He or she would best be advised to get out of town quickly: Don't those Robertsons all have guns and crossbows and such? "It's that time of year," the song goes, "when the world falls in love. Every song you hear seems to say, 'Merry Christmas,' may your New Year's dreams come true." But I'm not waltzing through the Christmas season. Oh, I like the lights and the carols well enough. But my Long Suffering Spouse and I are going to have to go shopping tomorrow. I am not looking forward to spending money we don't have, on people we don't particularly like, to buy things they won't need and don't want. "What can we do about it?" my wife tries to reason with me. "They're family." I have suggested that we buy everyone -- including our own kids, for that matter -- an orange and a pair of socks. That's traditional, isn't it? And we won't significantly increase our credit card debt in the process. I have, in fact, suggested this once too often, at least, for my own good. Recently, as my wife brought up the subject of Christmas shopping, I had just opened my mouth when she told me to knock it off. Do not get me wrong. My wife is the exact opposite of a spendthrift. We live frugally, as we must, and Long Suffering Spouse gamely muddles along with practical restrictions I don't think either of our daughters would possibly accept. It's just that, at Christmas, my wife feels the need to buy stuff for her sister Josephine and her sister's kids and even her sister's still fairly-new husband, Ferdinand. "We didn't buy any birthday presents," she reminds me, "or graduation gifts" (two of Josephine's kids graduated this yea, one from college, the other from grammar school). "And they'll buy us stuff," she says, playing her best card last. "We could agree not to buy each other anything, you know," I pointed out -- but Long Suffering Spouse would actually have to speak with her sister to negotiate such an arrangement. She doesn't want to do that. "Besides," she said, "Abuela wouldn't like it." Game, set, and match to Long Suffering Spouse. 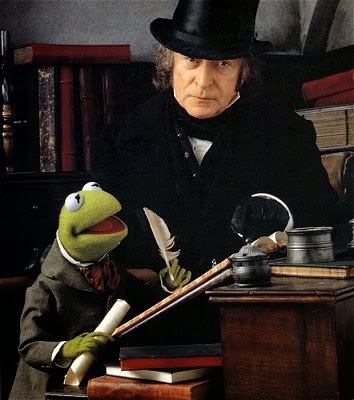 Still I find myself agreeing with Sir Michael Caine, who portrayed Ebeneezer Scrooge in The Muppet Christmas Carol (one of my wife's favorite holiday movies). Caine snarls at Bob Cratchit (Kermit), "Christmas is a very busy time for us, Mr. Cratchit. People preparing feasts, giving parties, spending the mortgage money on frivolities. One might say that December is the foreclosure season. Harvest time for the money-lenders." Just because ol' Ebeneezer is a bad guy doesn't mean he's wrong, does it? And what's wrong with an orange and a pair of socks anyway? Our TV died last month. We had to replace it. The DVD/VCR died two nights ago. That's something we'll presumably come home with tomorrow. We'll have buckets out in the den to catch the leaks from the roof tonight (we're having a bit of a thaw at the moment here in Chicago -- good news, mostly, except for the leaky roof). I'd love to replace the computer in the den -- it's eight years old now and the CD drive stopped working six months ago (there's still one viable URL port). Our kitchen is falling apart -- in fact, we've deferred so much maintenance for so long (it was suggested that we replace the furnace when we moved in -- 17 years ago -- and we never have), that it's hard to say where we should start to fix things. If we could start. My law practice stinks -- it takes a lot of time and returns little. I will make more than my Catholic school teacher wife this year -- I think -- but not much more. Things are actually better now than they've been for awhile. I just moved a huge balance from one credit card to another, taking advantage of an interest free offer -- saving myself $250 a month just in interest payments on that one account. I have reason to hope things will continue to get better. But why do I have to have this annual reminder of just how far I've fallen -- and how far I must climb to get back up? I don't think that makes me the Grinch. I don't think it even makes me Scrooge -- the three demons that torture my dreams aren't the Ghosts of Christmas Past, Present, and Future but rather MasterCard, Visa and American Express. But, you know, it's hard not to say "Bah Humbug." I will adjust my attitude, I hope, before heading out on the morrow with Long Suffering Spouse. But, seriously, what is wrong with an orange and a pair of socks? 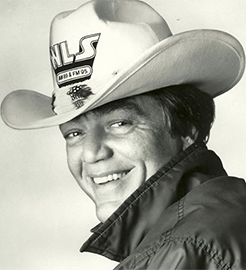 The passing of a radio DJ is seldom national news, and I was thinking that Larry Lujack's death yesterday from cancer at 73 probably wouldn't be. But it is. No less than überblogger Ken Levine mourns the passage of the one, the only Superjock this morning. I picked up my youngest son from college yesterday -- before the news of Lujack's death -- and somehow we got to talking about the passage of time. I think it was a sign advertising places in the high school class of 2018 (next fall's freshmen, believe it or not) that got Youngest Son going. "Can you believe it?" he asked. "2018 already?" This coming year, I told him, 2014, marks 40 years since I graduated high school. "How do you think I feel?" I asked. As bad as I felt at that moment, I felt much worse when Robert Feder broke the news about ol' Uncle Lar. Uncle Lar was still Suprejock -- WCFL, the Voice of Labor, recast itself as "SuperCFL" in honor of their most valuable property -- when I was in high school. Superjock on WCFL and Bob Sirott on WLS were, if I recall correctly, the voices of afternoon drive 40 years ago and every new driver knew how to push the buttons on the AM radio to switch between 890 and 1000 without taking their eyes off the road. Button pushing might be prompted by a bad song -- there were some truly awful songs in heavy rotation on both stations 40 years ago -- or by "zit cream" commercials. But the "bits" between the songs were the really good stuff. Sirott was the enfant terrible, the challenger. Lujack was the grizzled, bitter, burned-out veteran. His deep, deliberate, laconic delivery was unique, and seemingly entirely inappropriate to rock 'n' roll (Levine explains it better in his piece than I can but, then, he's a former DJ as well as a better writer). But whatever Lujack was doing, it worked for him. A couple of years after I graduated high school, WCFL changed formats, going from Top 40 to elevator music. The station didn't fire Lujack, however, and he wouldn't quit. Here is how he announced the format switch. Lujack would go back to WLS later -- his "Animal Stories" with "Little Snot-Nosed Tommy" Edwards are being remembered a lot this morning. I tuned in for them, too, even after I'd otherwise grown out of the Top 40 format. All too soon, however, in 1987, Lujack retired, moving out west eventually. Except for a six month stint on FM and a reunion with Edwards that lasted a few years on what wasn't much more than a 10-watt AM station in the early 2000s, Lujack stayed retired. But he stayed with us, too. Nine or 10 years ago, on the occasion of the 100th anniversary of our parish, I was asked to do the voiceover for the commemorative video. The parish hired a real filmmaker and everything -- her brother has directed several popular Disney features -- and she booked some studio time for me to come in and read the script. This was the first time I'd been in a real studio, with a professional microphone and headphones and all the knobs and dials I was told not to touch on pain of death. But when we were doing sound checks, I did my best Larry Lujack imitation. It was, presumably, an awful imitation. But imitation, even awful imitation, is the most sincere form of flattery. R.I.P. Mr. Lujack. I hope today you have a whole lot more of Jesus... and all the rock 'n' roll you may want. This blog first appeared on December 7, 2005... so this would be (would have been) my 8th Blogiversary. I've never been a big one for anniversaries. Money seems to know how to make itself scarce when Big Days loom on the calendar -- birthdays, anniversaries... Christmas. But I can't say I forgot my Blogiversary because I didn't want to buy myself a present, can I? One doesn't give presents for blogiversaries anyway. Not as far as I know. Still, 8 years. A milestone, surely. A lot of words from my keyboard. Many of them -- most of them, really -- mine (OK, can't say quite the same thing about the illustrations... I've stolen most of those). I just updated the blog Sidebar to reflect past Christmas posts. The list is by no means exhaustive. Exhausting, perhaps. I'd prefer to think that you might find at least some of them entertaining however. My real-world blog takes up most of my blogging time these days. I get more traffic there. But I'm not nearly as funny there. The AP is reporting that North Korean leader Kim Jong-Un has executed his once-powerful uncle Jang Song-thaek. "Against the backdrop of these shouts rocking the country [demanding that stern judgment be "meted out to the anti-party, counter-revolutionary factional elements"], a special military tribunal of the DPRK Ministry of State Security was held on December 12 against traitor for all ages Jang Song Thaek." Jang was accused of possessing "...a wild ambition to grab the supreme power of our party and state." He was found to be "...despicable human scum .... [who] worse than a dog, perpetrated thrice-cursed acts of treachery in betrayal of such profound trust and warmest paternal love shown by the party and the leader for him. Kim and his family presumably don't celebrate Christmas. It's probably just as well. In the present circumstances, this could be pretty awkward. Can you imagine the rather forced small talk during dinner? Unless, of course, Kim's aunt really disliked her husband. I'm pretty sure that I've never wanted to execute any of my relatives. I only had two uncles; I liked both of them. I suppose if we broaden the net out to include in-laws and their spouses, there are a few of whom I'm not terribly fond. Take Josephine's current husband Ferdinand, for instance. I prefer to drink heavily before having any interaction with him whatsoever, but (as Long Suffering Spouse warns me every Christmas Eve) it's a fine line between comfortably numb and in vino veritas. The stress of Nochebuena dinner can be enormous. Still, I don't suppose I'd want Ferdinand executed. Banished, maybe. I suppose I might get more bloody-minded were I suddenly given absolute power. Lord Acton's old saw about absolute power corrupting absolutely seems to have been proved over and over again. Thus, if I ever became Dear Leader, one of my ex-law partners would be best advised to leave town in a hurry. But that's only one out of a great many. I wonder what ol' Uncle Jang did to so offend his nephew. Perhaps this story has made the national news. At the east end of the Daley Center Plaza, wedged in between the skyscraping Hanukkah Menorah and the giant Nativity Scene is a festive Big Red "A," with a sign in front wishing passersby a Happy Winter Solstice. 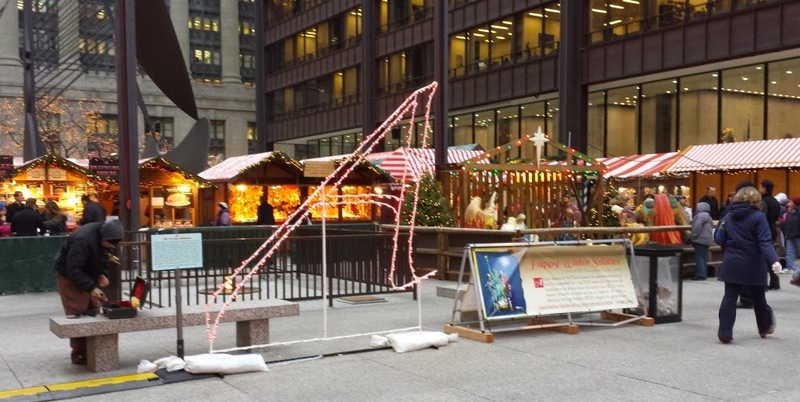 A group of atheists thought they would be clever and obtain the permits necessary to put up this display and thereby thumb their snooty noses at all of us superstitious inferiors who still profess belief in a power greater than man. Far be it from me to complain that the atheists don't have a right to believe in Nothing. But it seems to me that, with their Big Red "A," the atheists are doubly represented at the Daley Center. 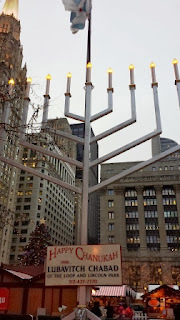 I mean, at the Daley Center these days, the Jews have only the Menorah. Christians have only the Stable. (The giant Christmas tree on the south end of the plaza is not a religious symbol.) But all the empty space in between -- all the Nothing -- is that not the sign and symbol of the true atheist? Now the atheists also also have a Big Red "A." Seems to me that's two representations for the anti-religionists, but only one each for each religious group. I said as much to Long Suffering Spouse when the story aired on the news here a week or so ago. Some smug professional atheist was interviewed, overjoyed that this rather pathetic ploy for attention was being taken seriously, at least by the TV reporter. You might not think that being an atheist would be incompatible with missionary zeal. But this guy sure acted like a True Believer, even if he believes only in Nothing. "Is that what the 'A' stands for?" she asked. "Atheist?" I assured her that this was the case. "Hmmm," she said. "I would have guessed it stood for something else."